Application virtualization is a great means to deal with malware. In particular ransomware cannot create massive damage if the malicious program is executed in an isolated virtual container which prevents any interaction with the computing environment. Unfortunately, most vendors of next generation endpoint protection solutions are directed on the protection of large private businesses and administrative bodies. End-user protection is falling increasingly by the wayside. Consumers must rely on inherently weak anti-malware solutions. By now some products are available which overcome of the most severe deficits of anti-malware solutions. They offer protection e.g. against drive-by downloads, zero-day malware or file-less malware, for private businesses, administrative bodies and end-users alike. The products of these companies are available for end-users. During the next weeks and posts I will discuss my experience with this products, with special regards to their ability to block zero-day malware and usability. 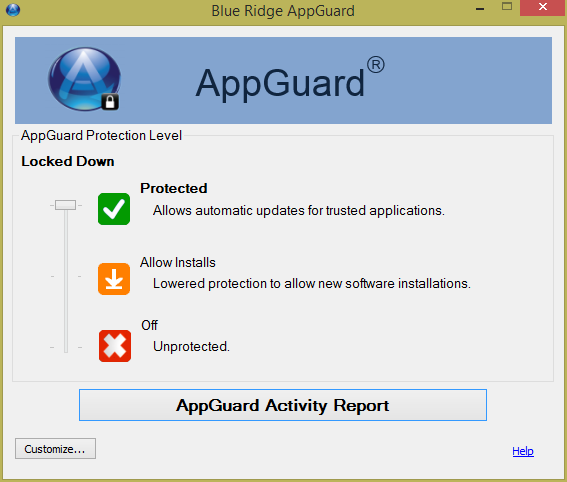 Today I will share my first experiences with Blue Ridge Networks ‘AppGuard Zero Day Malware Protection‘. Great zero-day malware is available from Malwr.com. Let’s get to work. Security Notification3.zip is delivered by email. The zip file contains a Word Document which loads a file called harakiri.pfx from the attacker’s command and control server and executes this file afterwards. With this, Security Notification3.zip is a perfect zero-day malware sample. I checked some more samples and got the same results in any case: AppGuard blocks the execution of the downloaded files. 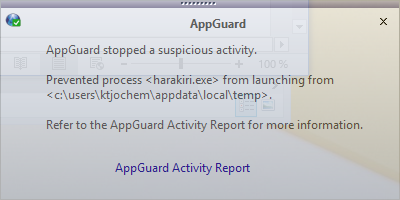 With this, AppGuard fully meets my expectations about zero-day malware delivered by Word-documents. By now Security Notification3.zip is detected by 35 of 56 anti-malware solutions on VirusTotal.com, e.g. as Trojan:O97M/Madeba.A!det by Windows Defender or as W2KM_DRIDEX.YYSVD by TrendMicro. This entry was posted in New Technology, Opinion, Survival tips and tagged AppGuard, Application Virtualization, Blue Ridge Networks, Cylance, Homeland Security Awards, Malwr.com, Next generation endpoint protection, Trojan:O97M/Madeba.A!det, W2KM_DRIDEX.YYSVD, WIndows Defender on May 29, 2016 by Klaus Jochem. Excellent information. I wish I had had it before I was ransom-hacked by the Russians.